As a child Matt Murdock was blinded by a chemical spill in a freak accident. Instead of limiting him it gave him superhuman senses that enabled him to see the world in a unique and powerful way. Now he uses these powers to deliver justice, not only as a lawyer in his own law firm, but also as vigilante at night, stalking the streets of Hell's Kitchen as Daredevil, the man without fear. 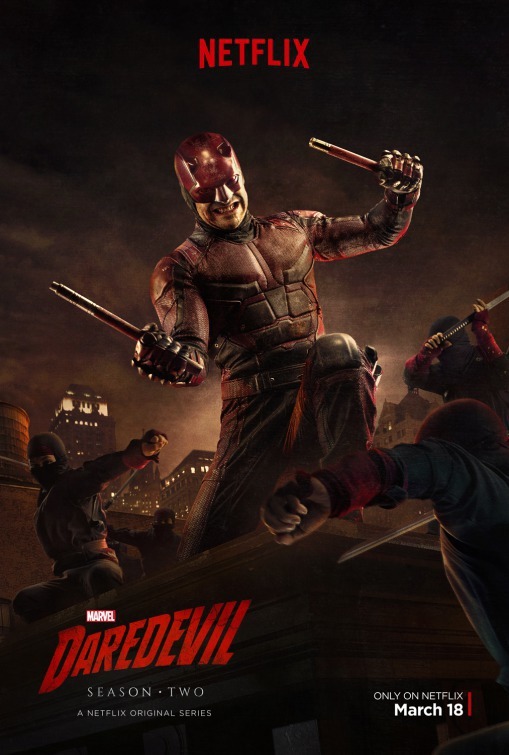 The first season sees lawyer-by-day Matt Murdock use his heightened senses from being blinded as a young boy to fight crime at night on the streets of New York City's Hell's Kitchen neighborhood as Daredevil, while uncovering a conspiracy of the criminal underworld being led by Wilson Fisk. In the second season, Murdock continues to balance life as a lawyer and Daredevil, while crossing paths with Frank Castle / Punisher, a vigilante with far deadlier methods, as well as the return of his old girlfriend - Elektra Natchios. My sister and bro-in-law recently turned me onto this Netflix original. It's been awhile since I saw the 2003 Ben Affleck film, so it's hard for me to compare the series with that film, but overall I think I like this even better-?? At the moment, I'm on like episode 8 or so. Blind attorney Matt Murdock (Charlie Cox) works in the legal profession by day, but at night he becomes a vigilante on the streets, which are controlled by a rising mastermind crime lord Wilson Fisk, played by Vincent D'Onofrio, in one of the best performances of his career I'd say-?? I read at Wikipedia that the creators of this show see this series as a crime show first, super-hero show second. That's more the way it plays. And I must say, the fight/action sequences in this are some of the best I've ever seen on network television-?? 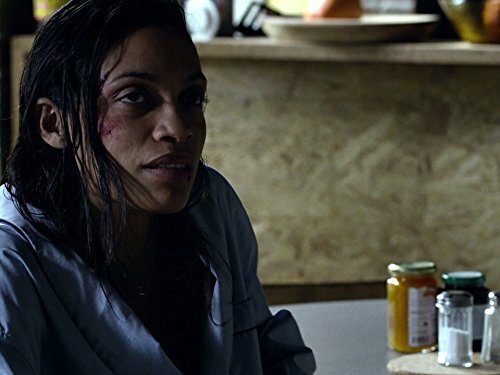 I also like Rosario Dawson's budding amalgam of Temple/Night Nurse- adds a nice touch to the series. Elden Henson, Deborah Ann Woll, Vondie Curtis-Hall, Ayelet Zurer and Bob Gunton also round out a fine cast. I read that this show, as part of the "Marvel Cinematic Universe", will eventually lead into a mini-series for "The Defenders", which will also include the characters Luke Cage, Iron Fist and Jessica Jones. Will be interesting to see how all this comes together. when i went through season 1 i really felt the show was great and it was. the hopes were high when punisher was introduced for season 2 and let me tell you punisher does not disappoint. For example : Nobu the great assassin who practically killed daredevil in season 1 was a no match to daredevil in season 2? Did he get old .. WTF? Electra was good in fact great showing her hold on matt and so was Stick. I really liked stick personally but the things about the hand, blacksmith, drug deal they were all untold and frankly unnecessary. The punisher was given less time on the screen and more time was given to the hand and the ninja garbage. If the season 2 would have just had punisher, elektra, kingpin, as the main characters removing the hand from picture with of course a better storyline and detail then the second season would have been just as great as season 1. Watch season 2 for Frank Castly/The punisher if you ask me.. Jon nails this role... Yes, it takes place in the Marvel Cinematic Universe (MCU) with such films as Iron Man (2008), Captain America: The First Avenger (2011), The Incredible Hulk (2008), and The Avengers (2012), as well as the TV shows Agents of S.H.I.E.L.D. (2013) , Agent Carter (2015) and Jessica Jones (2015). As well as upcoming series Luke Cage (2016), and Iron Fist (2017).